A box of arazá (eugenia spititouta stipitata) showed up in Farmer Margie’s barn last week. Robert Barnum had dropped it off. 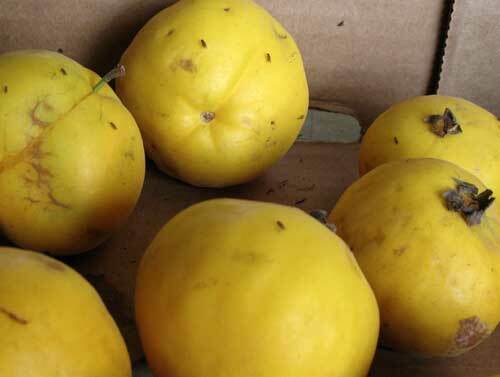 The fruit is round and yellow, with soft velvety skin like a peach but smoother — “smooth as a baby’s behind,” as Robert described. Arazá is very soft when ripe, smells sweet and perfumey but tastes incredibly tart. Farmer Gabriele stopped by and tried to eat a whole fruit but failed at the attempt. “It got me in the glands in my neck,” she said as she pointed to the sides of her throat. Each fruit has twice as much vitamin C as one orange, so it is said on the Internet. Cut up fruit, removing seeds and calyx. The skin is thin and can remain. Put fruit in blender and puree. You can freeze some in ice cube trays if you aren’t going to use it all at once. Add banana (to thicken it), sugar (or honey or agave) to taste, ice, and water and blend thoroughly. For sorbet, leave out the banana and freeze the mixture. For daiquiris, add rum. For ice cream, add heavy cream and freeze. Robert has been growing arazá at Possum Trot Nursery for the last 30-40 years. He learned about it on a trip to Costa Rica visiting friends who have a grove and run the Tiskita Lodge. (The fruit originally comes from the Ecuadorean rainforest.) Robert brought back seeds and planted them among the avocados in his grove, where the shrubby understory trees tolerate partial shade. They bear three or four crops a year. The trees are blooming now and will bear fruit again in about four months. If you want to buy arazá fruit, you can give Robert a call at 305-235-1768. Does anyone have an email or webpage contact for Robert Barnum – that he would not mind you sharing? I am looking for neem seed and all I can find is a phone number and I am out of the country. Robert doesn’t have a web page. I’ve forwarded your request, and he will email you soon.